For Group Bookings we will have a 25% cancellation fee if prior to one month in advance and 50% if within one week or less. Our dormitory with the two private rooms makes a perfect surf training center for a youth team or national training group. We hosted in June 2015, the ISA World Surfing Games. With four world class waves just 17 steps to the beach from our joint, we offer an exceptional training facility set up. Finca Popoyo is our 90 acres of paradise on almost a mile of near empty, pristine beach. Our bay, Bahia Punta Sardina hold at time 8 distinct surf breaks from the novice rollers in the south to the world class breaks of Popoyo in the north. We are the closet pillow to the wav by a long walk either directon down or up the beach. We serve the coldest beer on the beach, the largest and thickest smoothy, killer wrap tacos, and when the smoker is rolling the best BBQ in a long long ways. When staying with us we can arrange surf trips by truck, by boar. There is great near shore fishing. We have great beach and trailrides available for the equestrian. And so much more nearby! 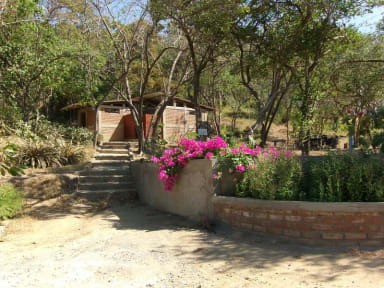 We are located in one of the best areas of Nicaragua, near to some of the most renowned natural landmarks of the area such as Refugio de Vida Silvestre Río Escalante Chacocente, Playa Popoyo, Playa and Playa Guasacate, amongst other wonderful landmarks and attractions of our place. The ISA House we built to serve as admin offices for the ISA when we hosted the World Surfing Games in 2015. We converted the offices into private rooms and the loft above is now an enclosed dormitory. From the rooms, you walk directly across our secure parking lot to the steps to the beach, 17 if counting! They have strong AC and good wifi. The dorms have big high ceilings, strong fans, good mossie screens, super high quality beds and high end linens. All our lodgers share our commons bathhouse; boys shower is outside and the women have a couple inside their side of the house!